Table runners are one of the easiest things to sew, yet make a tabletop pop with color and depth. If you can sew a straight line then you should have no problem sewing a table runner. Runners look great on buffets, dressers, entry tables and hall tables. 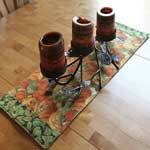 Make table runners for all the holidays that will add to your homes decorations. 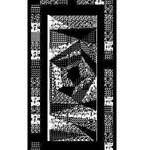 Take a look at the array of different table runner patterns listed below and pick one or several to grace the table tops in your home. This is a quilt as you go project with all the instructions right here. 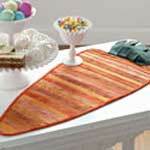 This table runner measures 26in x 50in and comes with step by step instructions. 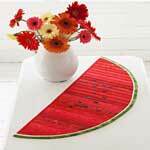 Use the flip and sew method to make this watermelon pattern. If you need a runner in a hurry this is the pattern for you.